Copyright Holder: Expired; no restrictions on use. Please credit the HBCA - Archives of Manitoba. This is an excerpt from a letter to the HBC London Committee from Anthony Beale (c. 1664-1731), the newly appointed governor of Albany Fort. Beale served the Company for most of his life, having first come to the Bay as a young and illiterate apprentice in 1678. Albany was Beale's first 'command' but not his last: he later commanded York and Churchill, where he died in 1731. Although the original letter for this excerpt still exists, (see Image 1), it was published in typeset by the Hudson's Bay Record Society and can be found on p15, 2nd pgh: "In your letter... to the same." "Honoured Sirs, Your kind letter dated the 30 of May 1705 came safe to hand by Captain Grimington in the Hudson's Bay who thanks be to God arrived here in safety the 28th of August last, which was no small rejoicing to us after all the hardships we underwent occasioned by your not sending of ships the year before last with a supply; for which you have lost sufficiently by omitting the same. For had here been goods to [have] supplied the Indians we had had the greatest trade for this two or three years last past as ever has been at this place expecially in small furs. But this failure of shipping so continually is the ruin of all, nay the very Indians now upbraid us with it, and tell us that we have but a single ship once in two or three years which is really very hard. In your letter you sent me your commission for being governor for which I return your honours most humble and hearty thanks and shall endeavour by the help of God to discharge that trust you have reposed in me to the utmost of my power for the promoting of your interest and shall encourage the trade of small furs as much as ever I can; for I understand they are the only furs that sells well in England. But no man can do more in that than Captain Fullertine has done for he was continually bidding the Indians kill martens, foxes, quickhatch etc. and for which they wanted no encouragement to induce them to the same." Check the Beaver Index - e.g., The French in the Bay, by Grace Lee Nute, Winter 1957. Read more about Beale in the Dictionary of Canadian Biography Online. Around this time, the French were in possession of most of Hudson and James Bays: the HBC only controlled Albany and a winter trading post across James Bay on Eastmain River. The coming and going of supply ships was inconsistent: Beale was actually appointed Governor in 1705, but did not thank the Committee until the following year because the supply ship that came out in 1705 had to winter in James Bay and did not get home until 1706. 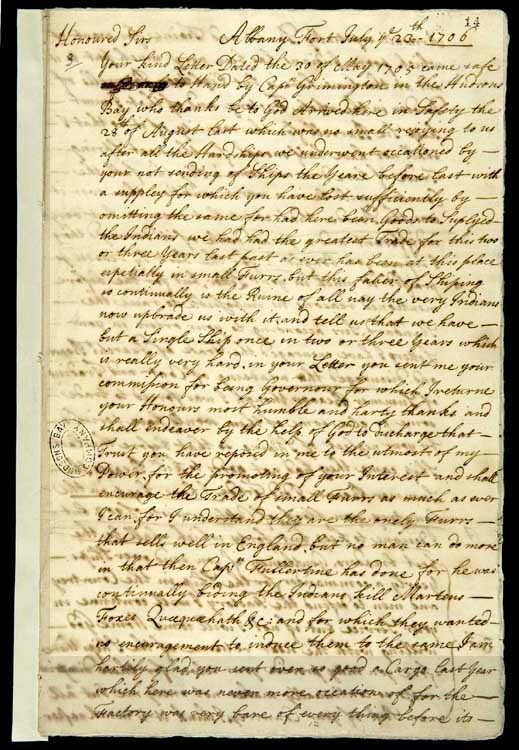 In this same letter, Beale told the Committee that if they could not guarantee regular supply ships and enough men to defend the fort against the French, he would come home, "for these disapointments makes not onely me but all men Sick of your Countrey."